As a special feature to mark the 50th posting, I thought I would give you a peek in my photo files. So many of you ask me where all these photos come from: NASA, of course! 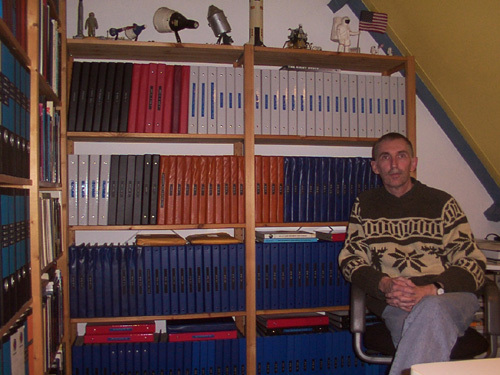 Here you see some of my photo-books, neatly arranged by project and by mission. And nothing on Unmanned Spaceflight h� ED ? Nope. I have some of the well-known books on Viking and Voyager, but that's it. It looks like we can expect "photos of the week" for the next 20 years! Great collection...if only my collections (including my non-space collections) were so well organized. My autographed photos are kept in 3-ring binders, but that's about it. As a side note, have you given any thought to archiving photos of the week on CD-ROM for sale to those of us who might want hi-res versions? I would love to someday get a hi-res version of that Story Musgrave walkout photo with the other crew members wearing their own Story "costumes." Wow! Ed! Not only do you have an incredibly huge collection... but it is all so well organized... an example for us all. That is an idea to consider. I have kept the captions I listed, so I can offer CDs with hi-res versions of the photos for sale when I reach the 100th photo, for example. Your photos are always great, but it is also interesting to see the man behind this. I like to know, how people look, which I call partners in a wide sense. He is so organized that he must be Dutch. Your collection is a credit to you ed, totally outstanding. Dang! I envy it. You may have the largest personal collection of photos. "Thats one giant book case for pictures,and one giant picture of mankind". Nice one Ed,very envious of your collection,keep them comming please. Impressive! Nice to put a face with the posts! Wish I had the opportunity to meet more of the the CollectSpace participants. Keep those photos coming, and thanks! Your collection is beyond IMPRESSIVE... that is a phenomenal achievement to put together a collection of that magnitude. My wife thought my 6 binders was a lot but when she saw the photo of you with your binders she just turned as said "I suppose you think I'm being let off lightly?" . Googleling via internet, you can find a lot of photos from space fans and CollectSpace participants, including me, but not under my nick name. All this time I thought that you took all those photos yourself! Great idea to post this one. Thanks, and kkep them coming! I have to ask: who's doing the dust cleaning? By the way, I live in the middle of the country, near Utrecht. I see you have what looks like the classic Revell Gemini capsule model on your shelf, complete with the display stand. I still have that Gemini model that I built in 1965; don't have the stand anymore, though. Perhaps the last vesting of my childhood possesions!